Media: Three-dimensional, word-laden collage, acrylic on masonite, 24" x 24"
This art piece is a visual expression created by nine members of the Long Term Supportive Living Program at Learning Services – Rocky Mountain Region Campus in Lakewood, Colorado. 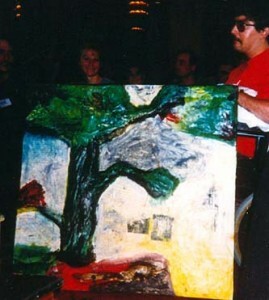 The composition directly portrays one group’s experience of life after sustaining brain injury. This art piece is a profound expression of humanity, not only including brain injury, but passing beyond the life changing experience. The group distinguished significant stages of their lives as being before, during and after their injuries. Each canvas represents one of these stage of life. The group agreed among themselves to use the image of a cottonwood tree, located on campus, as one consistent form to signify these different stages. The group took the idea further and each canvas represents a season of the year as it relates directly to their lives and brain injury. The before canvas is the fall season, shedding the old ways of the past. A season to represent during is expressed in the winter time. It is cold and isolated. The after canvas holds images of new growth and life in the spring. The unspoken understanding of the group was overwhelming – cooperation among group members was phenomenal. Each designated before, during and after canvas solely reflects the writing that of that time.